Power steering affects every aspect of handling, whether it’s turns and curves or just staying on the straight and narrow. Power steering fluid is as vital to safe driving as oil is to continued engine prowess. Without this vital fluid, your power steering will fail. If you have a power steering leak, you may not be able to turn the car with the force needed. 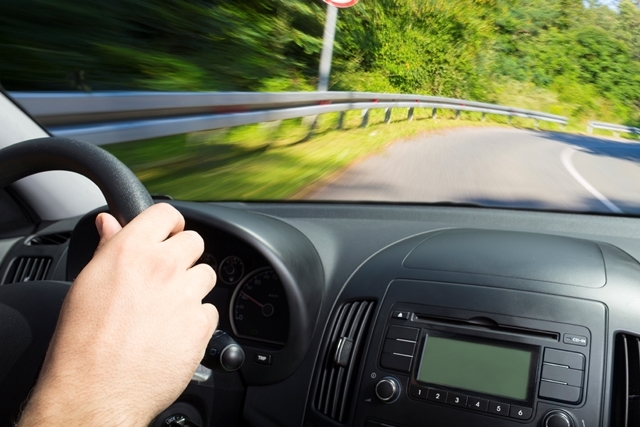 This can lead to unsafe driving situations and, worse, preventable crashes. If you detect a power steering leak, this is definitely a problem. If you act quickly, it may have an inexpensive solution. Basically, time and use are the enemies. As a car ages and/or achieves high mileage, the O-rings and seals lose mass and form. These seals may even break up into little chunks that circulate in the fluid. These vital components cannot do their job properly, and the precious fluid seeps out. If it were easy to replace these seals, like it is with spark plugs, that’s exactly what mechanics would do to prevent this problem. Unfortunately, replacement is not a solution. When working properly, with no leaks, the fluid is pressured by the pump. This pressured fluid then helps turn the wheels by pushing on pistons mounted to the rack. If fluid is leaking from any point along the intricate machinery, the fluid will lose its effectiveness. If the power steering leak is significant, there won’t be enough fluid to pressurize, leading to difficulty in steering. Why wait? Fix your power steering leak now! Working under stress, the pump will break from lack of proper fluid intake. 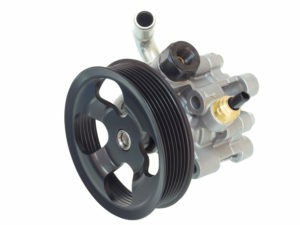 A damaged power steering pump costs hundreds to repair. In worst case scenarios, a power steering fluid leak may damage the power steering rack. If this happens, repairs may cost more than the car is worth. Clearly, these break-downs are worth avoiding, but can you? Actually, there is an effective product called No Leak®, which costs less than $10 per bottle. No Leak’s Power Steering Stop Leak can be used to seal current leaks and prevent future ones. No Leak is safe and compatible with all power steering fluids. Since O-rings and seals are not accessible, No Leak is designed to reach them “where they live”. No Leak is poured into the power fluid reservoir where it begins circulating through the system with the power steering fluid. As it circulates, No Leak acts to restore proper form and mass to the seals. After about 200 miles of driving, No Leak generally has restored the seals and O-rings to their proper effectiveness. This stops the power steering fluid leak and gets your car out of the danger zone. It’s important to note that a power steering fluid leak isn’t the only sign of power steering problems. You may hear a moan or whine when you turn the wheel. Before rushing to the repair shop, it is advisable to try No Leak to seal any potential power steering fluid leak. If your car is leaking power steering fluid, time is critical. Timely intervention with No Leak can restore effectiveness to the power steering system, and you may avoid hundreds in repair costs. Hello, please contact us at marketing@goldeagle.com and we can give you the link for a $10 rebate which you can use to try our No Leak Power Steering Stop Leak. Thank you! could u please share the link for the leakage stopper? Please contact us at marketing@goldeagle.com if you have any questions about this. Thank you. Can I get in on this rebate…. A mechanic replaced the rack and pinion and the power steering fluid still leaks. Now what? Hello, please contact us at marketing@goldeagle.com and we can help. Thank you. Took my car in for oil change. My mechanic said I have a slow leak of power steering fluid & will need a new power steering pump at a cost of $400 for pump and additional $200+ for labor. I have looked at the reservoir and the fluid is the same as when I bought it 3 years ago. Followed the hoses & all dry and no leaks underneath to ground. No symptoms like hard steering or whining. Is it likely my mechanic is trying to take advantage since he knows I am a single woman? In this situation it is recommended to seek a second opinion from a mechanic that is recommended by a trusted friend or family member. If your power steering fluid were leaking, your reservoir would be draining and there would be leaks on the ground. I would say it is time to look for a new mechanic. He’s trying to take advantage of you because you’re a woman. Get a second opinion and if there is no leak then go back to him and ask for a written estimate and then report him. Hi Jeff, since we are not able to assess your car in person, we would recommend taking it to a professional mechanic. you’ll want to flush the power steering fluid system. That indicates your power steering has rust in the line which can cause issues. my power steering goes on and off what causes this? the fluid in my reservoir is still full and no sign of leak, what is the cause of this? Hi Patrick, since we are not able to assess it in person, we suggest taking it to a professional mechanic. Thank you. I have the fluid coming from the reservoir cap with bubbles. It sounds it is not leaking, but I am losing a lot of fluid from there. I came from the Mechanic because I couldn’t move the wheel. Now is working much better, but I am still having the problem from the reservoir cap. The mechanic couldn’t find anything wrong, but I am still having that problem. I am worried that it can be worse. Here is very cold. The mechanic told me that could be the cause, but I am not sure. Thank you. Hi Fer, since we are not able to assess your car in person, we suggest taking it to get a second opinion if you are still unsure. Hi Jennifer, since we are not able to assess your leak in-person, we suggest taking it to a trusted, professional mechanic to be evaluated. Small amount of power steering fluid is coming out of the bottom of the steering gear when I turn the steering wheel to much, do you think the stop leak will help? Does not telling a costumer about this option for a minor leak and instead recommending an $800 rack replacement identify a mechanic as dishonest? My in-laws keep recommending this guy despite that being his advice to me and I don’t get why they think he’s such a gem. Since then, I question any mechanic about alternatives just to make sure he’s had a clear opportunity to state them. Ok, my ten year old user the same tactic on the surgeon who was about to remove her appendix, but it’s a good policy in general. Learning about alternatives is always helpful. Hopefully there are other trusted mechanics you are able to consult. I just purchased a 2008 Subaru Legacy and was told there is a leak in the power steering and it was $1,200 to fix. After driving it for a week, I haven’t seen any leaks in my garage and the steering is fine. How can I confirm myself that the mechanic that mentioned this is correct? Hi Michele, since we are not able to assess your car in-person, we would suggest perhaps getting a second opinion from a trusted professional mechanic. I have power steering fluid sitting on top of the power steering pulley. Is it the power steering pump? Hi Brandon, since we are not able to assess your car in person, we would recommend taking it to a trusted mechanic to be evaluated. You could also try No Leak Power Steering Stop Leak. Please email us at marketing@goldeagle.com if you have any questions. The power steering is dumping out in large amounts in reverse gear. Does that indicate anything more specific than bad seals in general? Hello, Hi Brandon, since we are not able to assess your car in person, we would recommend taking it to a trusted mechanic to be evaluated. You could also try No Leak Power Steering Stop Leak. Please email us at marketing@goldeagle.com if you have any questions. Who carries your product in Honolulu? Hello, please email us at marketing@goldeagle.com and we can help find the product you are looking for in that location. I was told my “Steering Pump” is leaking. Will your product fix that? And what are the risks from using No Leak. Some sites say it can ruin the whole power steering system. I surely don’t need that. $1250. quote just to replace the pump. While there are many reasons why a steering pump may leak, given that NO LEAK® Power Steering Stop Leak has a pretty good record in these situations, it would not hurt to try it to see if it resolves the issue. If the leak continues after 200 miles of regular driving then perhaps consulting your mechanic would be the next step. How are we going to use the Stop Leak fluid? How much to use? 1. Turn off engine. When it isafe, turn heater control to hot. 2. Remove radiator cap and pour entire contents into the radiator. If there is no access to the radiator, adding it to the coolant reservoir is acceptable. 3. Make sure that the coolant levels are correct. 4. Start engine and let it run for 10-15 minutes. Drive normally. Please contact us at marketing@goldeagle.com and let us know if you have any questions. Hope this helps! i have a power stearing leak i put power stearing fluid in like 3 months ago because of wining its doing the same thing i also noticed fluid on the ground. Is it ok to try the no leak at this point? and are the discounts still available? Since the leak has come back while there is NO LEAK already in the power steering system, even after 3 months, it’s recommend to have a certified technician take a look to determine why the leak has reappeared. At this time we do not recommend a 2nd application unless the system is flushed. I have replaced my power steering pump, and a hose. But my Tahoe steering is still leaking and not functioning properly. HEELLLLPPPP, PLEASE!! In fact, for decades now, the oring crush rings have been replaceable and replaced thousands of times. Easiest fix and usually the cause if a leak, 90% of the time it’s the high pressure hise at the rack entry or res bottle. Rarely usbut the seal out of the pump. Forgot to mention power steering leak in on a 2005 Dodge neon. Hi Ben, you can always try our No Leak Power Steering Stop Leak to see if that helps. We suggest you consult a professional mechanic if your leak persists. My power steering fluid is pouring out of the steering rack where the bellows are. Very badly on full lock. Would your product help in this situation or could my seals just have given up? Hi Luke, since we are not able to assess your car in-person, we suggest taking it to a professional mechanic. You could also try No Leak Power Steering Stop Leak to see if it will help your leak. Please contact us at marketing@goldeagle.com if you have any questions about our product. Thank you. The fluid receptacle seems to lose fluid less quickly if I only fill it half way.What is this about? I notice that the leak is right under where I add the fluid. Hi Andy. Unfortunately, since we are not able to assess your car in-person, we suggest taking it to a professional mechanic. I wish I checked your site before I agreed to have my power steering pump replaced. This process of changing my power steering pump indeed caused me lots of grief and money! No whining sound ’til after it was replaced, metal to metal grinding sound & very difficult to turn the wheel. Told that air control valve is leaking oil. I was told that the oil came from the pump. Do I have to pay for the air control valve? Why would it leak oil? There are many reasons why leaks occur. It could be from a faulty or worn-out seal or gasket to damaged parts. Perhaps it is still best to get a second opinion and ask if NO LEAK® Power Steering Stop Leak would be helpful. Please contact us at marketing@goldeagle.com if you have any questions about this. I have just added a second bottle of Lucas power steering stop leak. The instructions on the bottle say to add one or two bottles. There was not enough room in the cylinder to add two bottles. So I waited 2 or 3 weeks until I began seeing drops in my driveway again and the fluid was low again. Then I added a second bottle today. What are the chances that this will fix the problem? How much would it cost to have a mechanic fix the problem if this does not work? Hi Dee, unfortunately we are unable to help as this is not our product. We would recommend contacting them for assistance. Thank you. My 2002 Lincoln LS is leaking power steering fluid. It started Saturday night I stopped at a store and when I came out I saw a red spot under my car on the driver’s side and there was smoke coming from under my hood. I purchased and added power steering fluid and got home OK. Now I can’t drive 2 miles before the fluid is drained , my steering makes a loud whining noise and becomes very stiff. hi . yesterday when i was checking my oil was low and i thought i put in oil i realize by mistake i put in a little of power steering fluid by mistake. what damage will it cost to drive it, can it blow up and get on firer and what and how should i change it. Hi, Christine! In most cases, we recommend to have an oil change as soon as possible. It will not immediately cause any problems, unless a large amount was added. In this case, consulting with a mechanic might be a good option. If you have any other questions please contact consumer support at producttechsupport@goldeagle.com. Please inform me where I can by Noleak.